Mutton or chicken cooked with aloo bukharas (Indian plums) is a Royal dish which originates from Nizam province. 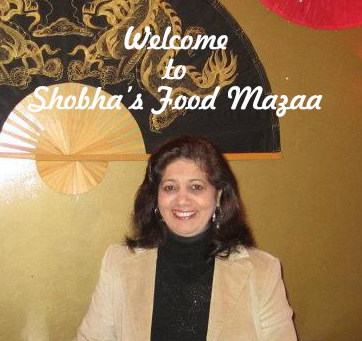 It is quite popular in Awadhi Cuisine too. 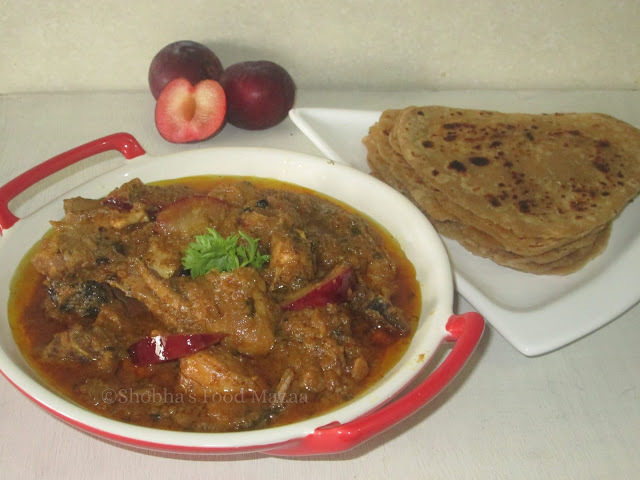 Usually dry and fresh plums both are used in this preparation but I have used only fresh plums which have given the curry a lovely golden colour and a mild sweet and tangy flavour. I skipped adding the dried plums as they make the gravy more sweeter. 1. Wash the chicken pieces. Marinate them with half the quantity of curd, ginger garlic paste, aloo bukhara paste and spices. Set aside for few hours. 2. In a pan heat the ghee or oil and tip in the whole spices. 3. When they give out a nice aroma, add the remaining ginger garlic paste and onion paste. 4. Saute until the smell from the onion goes away and it turns into golden colour. 5. Now add the marinated chicken pieces. 6. Stir fry for few minutes and add the spice powders and salt. Cover the pan and simmer the chicken after adding half cup water until the oil separates. 7. When it is almost done, add the aloo bukhara slices and simmer for few minutes. Adjust the consistency of the gravy as per your liking. Garnish and serve with rotis, naans or plain rice. 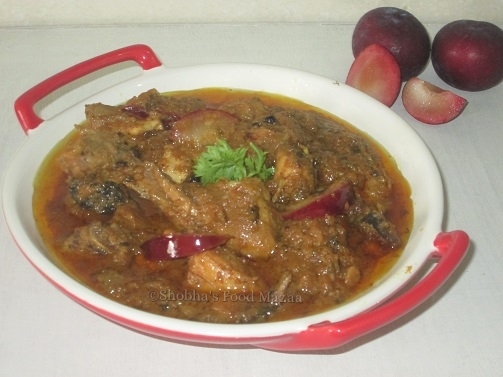 Nice idea of adding plums to the chicken curry. Very innovative idea. Thanks Mina.. It really was so delicious. I wouldn't have thought to add plums. I bet it gives the dish a subtle sweetness! Yes Heidi.. the taste was awesome ! My mum used to use aloo bukhara in many dishes, such a great idea! Yes dear .. they taste so good.